On February 15, 1963, Boston’s cardinal Richard James Cushing (1895–1970) was the guest on “Conversation Piece,” an afternoon talk show on local radio station WEEI. Not for the first time since the campaign and election of President John F. Kennedy, a Boston Catholic, Cushing addressed public concerns about the role of the Catholic Church in politics. As Kennedy himself had done, Cushing offered the assurance that Catholics did not believe religious viewpoints should control political decision making in the democratic arena. The leader of 1.8 million Catholics in the Boston Archdiocese, Cushing told the radio audience that he had no desire to impose the Church’s moral judgments, by using his considerable influence over Massachusetts legislation, on people of other faiths. The statement practically begged for a follow-up: What about birth control? In Massachusetts in 1963, there was hardly a more delicate question for the Catholic hierarchy. The federal government’s approval, in 1960, of the first birth control pill—developed by a Catholic physician in the Boston area, as it happened—had brought contraception into a new era. Yet providing contraceptive devices and even information on birth control was illegal in Massachusetts, as it had been since 1879, leaving the Commonwealth as one of only two states (Connecticut being the other) in which contraception was, practically speaking, against the law. The lines were opened to callers and the inevitable question came quickly. Few people knew it at the time, but the anonymous female caller who asked if Cushing considered the state’s ban on contraceptives to be “bad law” (as the Boston Globe reported) was Hazel Sagoff, executive director of the Planned Parenthood League of Massachusetts (PPLM). Sagoff got the answer she wanted, indeed the one she had been led to expect by a Cushing confidant some two weeks earlier. For the first time in public, Cushing suggested that the law against contraceptives should be changed. “I have no right to impose my thinking, which is rooted in religious thought, on those who do not think as I do,” he said. “If and when such legislation comes before the voters again,” he reflected, he would “confer with the [Church’s] best authorities” to find out “how I am obligated.” The cardinal declared he would continue to explain Catholic teaching. (Briefly, the Church held—and holds—contraception to be a denial of natural law, a turning against the procreative nature with which God imbued human beings.) But he would “not go out campaigning”: In a pluralistic society, Catholics ought not to insist on a civil law so divisive and unenforceable. Church officials then had stressed the need to align state laws with those of God, to protect citizens and to create God’s kingdom on earth. Cushing termed the state’s birth control restrictions a “unique advantage” for Massachusetts and defined contraception as “anti-social and anti-patriotic, as well as absolutely immoral.” In tone, his statements recalled a nation recently at war. They also reflected the theological influence of the archdiocese’s powerful auxiliary bishop at the time, John Joseph Wright ’31. In 1942, Wright had published a book titled National Patriotism in Papal Teaching, in which he argued for the role of the Church as a “unifying social instrument.” The moral stability of the state, Wright said, depended on the moral stability of the family, and birth control struck at “the existence and vitality of the fatherland” by lowering the national birth rate and the nation’s standards. Did the cardinal’s statement on the radio in 1963 represent a political recalculation? Possibly. Cushing was ever a man of his times. For example, in a pastoral letter in 1960, he had articulated what seemed, for him, a new view of Catholic life in America. A pluralistic democracy—a “society of differing beliefs”—he said should stress what unifies its people, rather than what divides. Cushing published the letter on March 12, during the week of the first presidential primary, likely attempting to alleviate concerns about religious views attributed to presidential aspirant John Kennedy. But if political realities informed Cushing’s altered tone, new theological influences do more to explain his shifting perspective on Church-state relations and ultimately on birth control legislation. Among individuals who had dealings with Cushing at the time, and among scholars, Cushing is known to have been a man open to persuasion—a willow more than an oak. In 1950 Bishop Wright left Boston for Worcester, and in 1959 Wright left Massachusetts altogether (he would go on to become, in 1969, the highest ranking American in the Roman curia, the prefect of the Congregation for the Clergy). At a time when the Church was in an intense internal debate over its role in democratic societies, Cushing found a new theological advisor whose progressive influence on Catholic leaders was growing. The U.S. Jesuit theologian John Courtney Murray (1904–67) published his first book, We Hold These Truths: Catholic Reflections on the American Proposition, in 1960 (chapters from it appeared throughout the 1950s in other publications). In the book, Murray highlighted the distinction between public laws and private morality. Laws are always meant to legislate morality, he wrote, but there must be limitations on the types of moral judgments civil laws can make. A public law should address private morality only if that law will be obeyed and enforced. “In the absence of this consent,” he said, “law either withers away or becomes tyrannical.” Murray defined pluralism as “coexistence”: It “implies a disagreement and dissension within a community. But it also implies a community within which there must be agreement and consensus.” Richard Cushing—disenchanted with strife, politically attuned, and increasingly respectful of differences (he had a Jewish brother-in-law, after all, whom he admired)—became Murray’s student. It was, as far as is known, primarily a long-distance relationship, preserved in letters and memoranda, with Murray situated in Maryland; the two also may have conferred during trips to Rome for the Second Vatican Council (1962–65). In September 1964, word spread that Murray was to be “first scribe” for a declaration on religious freedom that would be promulgated by the close of Vatican II. For those who followed Catholic affairs, the news could be taken as a sign of the Church’s direction as it emerged from debates on its place in the 20th century. Murray’s influential views on coexistence explain why the Boston Archdiocese would support ending a full ban on contraceptives in the 1960s. The actions of two Boston area lay Catholics, both medical men, were key in determining when the ban would fall. Their names were John Rock (1890–1984) and Joseph Dorsey (b. 1938). When John Rock, a Catholic physician from Brookline, developed an oral contraceptive in the early 1950s, he expected it to prove morally acceptable to the Church. Well into his sixties at the time and a professor emeritus of gynecology at Harvard University, he believed the pill represented a natural form of birth control in line with the Church-approved rhythm method. He noted that women’s normal cyclical secretions of progesterone established a “pre- and post-menstrual ‘safe period. '” His pill, Rock contended, only elongated that safe period. Nine months later, Rock published a book called The Time Has Come: A Catholic Doctor’s Proposals to End the Battle over Birth Control, in which he restated his views. The book won some converts in the Church hierarchy—a Dutch bishop, a former archbishop from Bombay. That same year, Pope John XXIII launched the Papal Birth Control Commission—its official title was the Pontifical Commission for the Study of Population, Family, and Births. The commission would consider the issue for some three years. Rock’s book had a direct impact on the debate within his state, as the doctor declared that many Catholics desired a change in the Massachusetts law “without the accompanying unpleasantness and bad feeling” of a vote and “without violating the religious convictions” of any citizen. Later that spring, Rock delivered a lecture at the Harvard Medical School (the subject, as someone in attendance recalled, was “the importance of monogamous relationships”). Afterward he was approached by a 25-year-old Harvard medical student, Joseph Dorsey. The young man, a Catholic, had questions for the doctor about the state’s contraception law, the Church’s position, and whether the pill might be an option for Catholics. Dorsey had been educated at two Jesuit-run institutions, Scranton Preparatory School, in Pennsylvania, and the College of the Holy Cross in Worcester. While beginning his medical training at Dartmouth College—his first experience outside Catholic education—Dorsey found himself starting to question the practice of using civil laws to legislate certain types of morality. After speaking with Rock, he wrote a letter to Cardinal Cushing, whom he had never met. Four decades later, when I interviewed Dorsey, he recalled telling the cardinal of his interest in the state’s birth control law, describing his encounter with Rock, and expressing his desire to discuss the issue with someone inside the Church. The young doctor was contacted by Rev. James O’Donohoe, a professor of moral theology at St. John’s Seminary in Brighton. 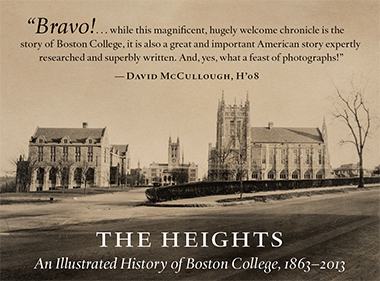 Soon after, Dorsey and his wife were hosting a dinner party in their Boston apartment that included O’Donohoe; Msgr. Francis Lally ’40, the Pilot’s powerful editor; and James Faulkner, a former dean of the Boston University School of Medicine and member of the group that published the New England Journal of Medicine. Equally significant, Faulkner’s wife served on the executive committee of the board of PPLM. Over the next few months, Dorsey and his new contacts formed a plan involving legislation to repeal the state’s restrictions on the dissemination of birth control. They decided to publish their blueprint as an article written by Dorsey. In July 1964, Dorsey sent a draft of his text to Cushing, asking for his thoughts. (He also sent a copy to Rock.) Cushing replied that if the issue faced another voter referendum, he would “state very emphatically, over and over again, the stand of the Catholic Church” in opposing birth control, but he would “make no effort to enter into a political phase.” Cushing told Dorsey outright that the repeal effort “should never be brought to a popular referendum again.” Together with the cardinal’s comments, Dorsey received a formal imprimatur from the archdiocese, signed by Cushing and O’Donohoe, recognizing that nothing in his article contradicted Church teaching. Dorsey’s write-up appeared as a “special article” in the October 15, 1964, issue of the New England Journal of Medicine, under the title “Changing Attitudes Toward the Massachusetts Birth-Control Law.” Monsignor Lally wrote a short introduction, in which he noted that many felt “the time was ripe for reconsidering” the law. After the article’s publication, medical and legal professionals, including Dorsey, secretly gathered for an informal series of conferences led by the state’s health commissioner, Alfred Frechette, to propose wording for a bill to lift the state’s restrictions on birth control. O’Donohoe attended at least once, in late November. These conferences, which were not reported in the media at the time and have not been discussed in subsequent historical narratives, were conducted with a looming deadline: December 2, 1964, was the final day to submit a bill to the legislature for consideration in the next legislative session. On March 2, 1965, a Massachusetts legislative panel, the Joint Committee on Public Health, held an open hearing on the proposed act. Cardinal Cushing had been invited to testify but, as he was recovering from surgery, he sent his personal attorney, Henry Leen ’29, to deliver prepared remarks. Unbeknownst to legislators and the public, the remarks were written by John Courtney Murray, at Cushing’s request. The legislation under consideration, Leen read, was not without faults. The bill lacked “proper safeguards” for the young, for instance. Although unable to endorse the proposal, the cardinal requested that the governor, Republican John Volpe, appoint a commission of “citizens representing a broad community consensus” to craft legislation that would “satisfy the conscientious opinions of the whole community.” Cushing’s request “did not come as a surprise” to the bill’s proponents at Planned Parenthood, according to archived PPLM documents. They understood that the cardinal was stalling, awaiting the theological support from Rome that the Declaration on Religious Freedom would bring. The Boston Globe gave the hearing a front-page banner headline: “Cardinal Relaxes Anti-Birth Law Stand.” And soon after, the governor appointed a 21-member commission to redraft the bill. On it sat Dorsey, the Pilot’s Lally, Cushing’s lawyer Leen, and at least three other Catholics. That same day, June 7, 1965, the U.S. Supreme Court decided Griswold v. Connecticut, making Connecticut’s bar to the use of contraceptive devices unconstitutional, and leaving Massachusetts the last state with a blanket ban. (The decision didn’t affect the Commonwealth because Connecticut’s law had banned not only distribution but also use, and it was on this second aspect that the case turned.) Three weeks later Volpe’s commission unanimously approved a revised bill. It permitted access to contraception in the state for married persons over the age of 21. Leen endorsed it publicly at a legislative hearing. The Second Vatican Council ended on December 8 with a closing address by Pope Paul VI that bore messages for Council fathers, world rulers, scientists and scholars, artists, women, the poor and suffering, workers, and youth—but no statement on birth control. (That would await the issuance by Paul VI of Humanae Vitae—Of Human Life—on July 25, 1968.) Dignitatis Humanae, the Declaration on Religious Freedom drafted largely by Murray, was promulgated on December 7.